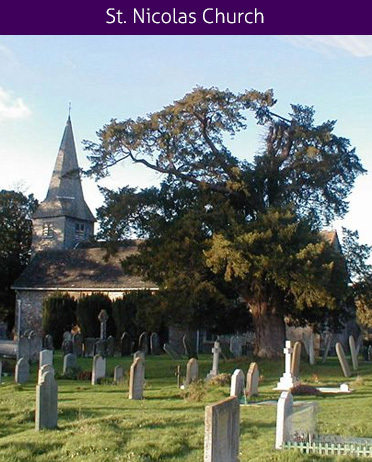 The church of St Nicolas is in Itchingfield hamlet in the northern half of the parish. The church was originally built in the 12th century and part of this early building still survives in the current structure. The church has a very rare all wooden tower. In the churchyard is a small 16th century building known as the Priest House, a small but unique survival of a 16th century cottage type dwelling. It was probably built to house a clerk in holy orders employed to administer services in the parish. It was extended in the 17th century and used as the parish almshouse until the 19th century. In the early 1990's, the wooden spire of the church was re-shingled and part of the church roof re-laid. The substantial cost was met by a grant from English Heritage and much energetic fundraising within the parish.